Baby teeth or primary teeth usually come in at age 3-4 months, although they start to break out through the gums when the baby is 6 months to one-year old. The type of teeth that appear depends on the timing, but at age three, the 20 primary teeth will appear. Whether they fall out or are replaced with permanent teeth, baby teeth are extremely important. 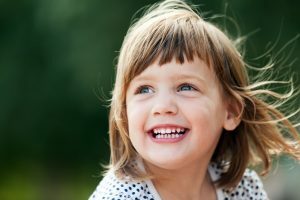 Why are baby teeth extremely important? Baby teeth like permanent teeth are susceptible to cavities. Research shows that over 50% of children get tooth decay before they turn five. So, it is important to prevent cavities to avoid the loss of a baby tooth. If a child loses a baby tooth at an early age, the permanent teeth can float into the empty space, making it hard for the other permanent teeth to find a space when it is time for them to appear. This means that proper dental care starts after giving birth. Cultivating good oral habits will benefit your child for a lifetime! Bring your child to Dr. James Voyles as soon as they turn a year old. Visit Hilliard dental office now and be amazed how children are happy going to this clinic.